In the country of Proper, people are given a future path upon birth, a fate from which they mustn’t stray; otherwise, they are declared fateless and forced into camps. When a genderless individual with a mysterious past lands in one of these camps, the corrupt scramble to maintain order. Knowledge will set the fateless free, if only they have the courage to bite the apple. 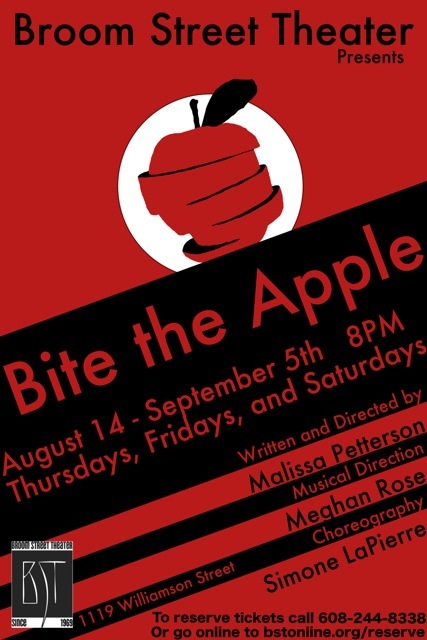 A political thriller about free will and social injustice, Bite the Apple opens Friday, August 14th and runs Thursdays, Fridays, and Saturdays through September 5th. Broom Street Theater is located at 1119 Williamson Street, Madison, WI. House opens fifteen minutes prior to curtain. To reserve tickets, please call 608-244-8338 or go to bstonline.org/reserve. We’ll see you in Proper!